Unfortunately the "Free 6-Pack of Kleenex Facial Tissues" offer is no longer available. Allergy season causing the sniffles? 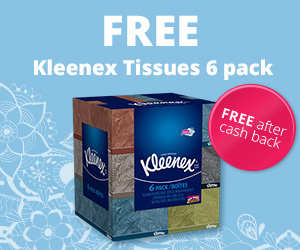 Get a 6-pack of Kleenex boxes for free with TopCashBack. Simply, join TopCashBack and sign up for a free account. Once signed up, you'll be directed to the Kleenex Freebie offer page. Click ‘Get Offer Now' and it'll take you to Walmart. Add 1 Kleenex Everyday,160 Tissues per Flat Box, 6 Pack, Facial Tissues priced for $8.48 to your cart and checkout. This is a free in store pick up offer. Within 14 days, your account will be credited with your free $8.48 in cash back. *Make sure that your cart only has one $8.48 in your cart during checkout. Promotion valid through November 15th, 2018.